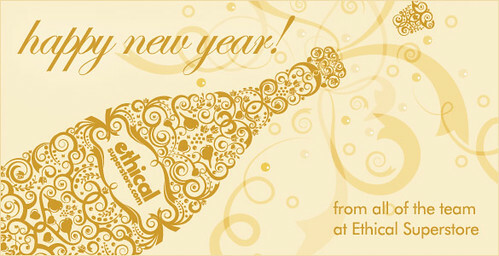 On reflection, 2010 was a great, yet challenging year for all of us here at Ethical Superstore. We moved warehouse, moved systems and expanded our range. We had snow-cancelled deliveries to us, snow-affected deliveries to you and even ran out of coffee in our offices for two whole days (we don’t like to talk about that, though); we’ve had it all in 2010! Though the weather may be uncertain, there’s one thing we’re sure of; our commitment to bringing you the widest range of earth-friendly, Fairtrade, Organic and Eco-Friendly products available on the web – 2011 looks to be a very good year for the Ethical Consumer. Thank you for your support in 2010- here’s to a Happy New Year from our team to you and yours, and all the best for the year ahead.